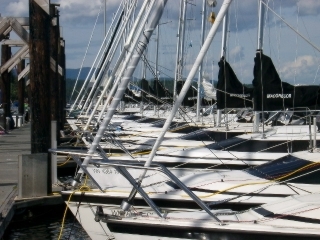 The regatta will be a two day event Moorage on March 29 will be at the Longbranch Marina, Filucy Bay. There we will join the Cruisers for an after race potluck and get together. See the Cruise News. The race is open to all SSSS Members. Race fees not required. Will be determined Thursday Night March 27, based on those registered then. Boat must register by Thursday March 27. 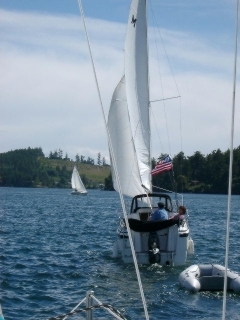 Boats registering should indicate whether they will race as a double-handed, Jack and Jill, or full crew boat and whether they will use flying sails. Boats that have not been racing must get a handicap by then. All boats currently racing will retain their existing handicap. Each boat has an individual start time based on her time allowance for the race (ones handicap by the race distance). We will post here a list of start times by handicap. It is the skipper’s responsibility to find their start time before the race and not start before then. Your engine must be off for 5 minutes before you cross the line to start. GPS time is the official time. First start 1000, The the slowest rated boats will start first. The Race Committee will make no sound or flag signals to signal a start. They will make one sound to signal the time at 1000 and every half hour there after until all have started. Sunday: Start going sourth between the RC boat and the A frame house near the entrance to Filucy Bay. Finishing between the Olympia Shoal Mark 4 and a RC Boat. Boats that do not complete the full course must turn in a daily log sheet with the above information for that day. Failure to comply will result in being scored as DNF for the day. If the course is completed a log sheet will not be required. Time Limit Both Days: 1730. At this time the race is over. This amends RRS 35 Time Limit. The RC boat will monitor VHF channel 72 during the race for emergency and withdrawals. Other communication will be terminated. Ties will be broken by comparing the difference in finish times between the boats tied: the boat that finished ahead of the other by the largest time difference will be the winner.